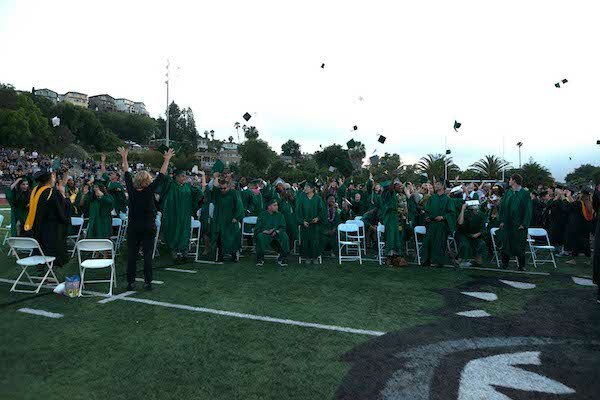 Graduation marks the end of the school year, and on June 1, 542 Helix students donned their caps and gowns to participate in Helix’s commencement ceremonies. This is the largest graduating class in at least the past two decades. People might picture a quiet campus with no activity during the summer months, but nothing could be further from the truth at Helix. This campus never sleeps! There is still work to be done, and there is plenty going on at Helix. Students will return to some changes to the school facility. First, renovations continue on the former performing arts buildings, transforming them into a Student Services building, which will be completed before the start of the school year. The hardscaping surrounding the renovated buildings will feature a “Brick Garden,” which will also be constructed over the summer break. Members of the public can purchase personalized bricks to be placed in this area and are available through the Helix High School Foundation. 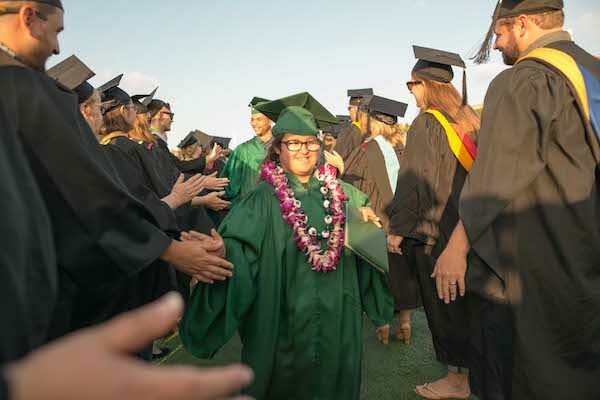 The bricks are a great way to honor a loved one, celebrate a graduation, recognize an accomplishment, and be a permanent part of the Helix campus. The student parking lot will undergo a transformation, as the installation of covered parking will begin. The shade structures will serve as the foundation for multiple solar panels to provide power to the school. This project will be completed this fall. Construction will also continue on the Career and Technical Education (CTE) buildings on the south end of the campus. These buildings will house the classrooms for the Helix Explore, Develop, Gain and Earn (EDGE) program, which includes technology and visual arts classrooms and the sports medicine classrooms. This will also be the site of the fitness center and weight room (which will include equipment provided through a grant from the former San Diego Chargers), as well as team rooms for the athletics department. Along with the CTE classrooms, additional accommodations are being provided for Helix EDGE, which will focus on high-need, high-skill, and high-wage career areas in Sports Medicine, Business Entrepreneurship, and Computer Science Engineering. A large section of the library will be converted to a Makers’ Space, where students will be able to work together or alone on various projects using different types of technology and equipment. Besides work on facilities, staff and students also account for school activity on and off campus. Through the month of June, each Helix student, along with a parent or guardian, participated in a meeting with a member of their Grade Level Team to discuss their short- and long-term goals, and create a class schedule that reflects those goals. At their meeting, incoming freshmen and juniors received a book to read over the summer as part of the “One Book, One Helix” program. Freshmen will read “I Am Malala,” a book about a young girl who was shot by the Taliban in Pakistan for attempting to access an education. The focus of the book is how one person can make change in the world. Juniors will read “Who Owns the Icehouse,” and will learn about the entrepreneurial mindset through lessons learned by an unlikely entrepreneur. All of the students will complete a project related to their book, and their classes will incorporate themes and ideas taken from the books. Some students are participating in summer school, as well. Courses are being offered to students to ensure they are ready for the next school year, and to help meet their requirements for graduation. Incoming freshmen have the opportunity to participate in a summer math enrichment program to prepare them for the rigor of Helix’s math program. Other students are taking advantage of Helix’s college readiness program by participating in “Rise Up” and “Summer Personalized Assistance with College Enrollment” (SPACE). Approximately 100 Helix sophomores are working with teachers to explore college options and find out more about what it takes to go to college by attending Rise Up sessions. Jordan Martinez greets Helix staff after receiving her diploma. The week-long program will culminate in a visit to the campuses of University of California, Riverside and California State University, San Marcos. In addition, members of the class of 2017 are participating in the SPACE program to ensure they have everything in place to attend college in the fall. The program is offered as an antidote to “summer melt,” a phenomenon where 10 to 40 percent of students across the country who intended to attend college fail to enroll the following year. Students from low-income backgrounds are especially affected by summer melt. A Harvard University study shows that intervention programs such as SPACE can alleviate the effects, and increase college enrollment rates. Teachers and staff participated in a series of workshops through Helix’s Summer Institute. Several short courses were offered for staff to work on improving instruction with a focus on student learning. In addition, a Leadership Academy was offered for campus leaders (Grade Level Principals, Teachers on Special Assignment, Department Chairpersons, Course Level Team Leaders, etc.). Through this workshop, staff members focused on the current status of Helix and what changes need to be made and what actions need to be taken in order for the school to continue to move forward. With all of this activity, it’s hard to believe that there was time to celebrate, but it happened! Congratulations and best wishes to our 2017 retirees Lisa Cooper, Kris Irving, John Singer, and Claudia Zoumaras. Remember, once a Scottie, always a Scottie! While there will be activities on campus in July as noted, the main office will be closed until Aug. 1. If you have specific questions regarding Helix, please leave a message and someone will return your call when we return. Have a great summer!